Chief Minister Sarbananda Sonowal on Monday said the government has set the target of completing constructions of all main roads by 2020. The chief minister said all elected public representatives must work hard to build superior road infrastructure in the state. He claimed under the leadership of Prime Minister Modi, both the central and state governments have been able to perform exceedingly well in providing quality governance and people from all sections of the society have been benefited by different schemes of government. The chief minister urged the MLAs to highlight the schemes of the state government like Atal Amrit Abhiyan, setting up of 19 Cancer Hospitals in the state, free admission into colleges and distribution of free textbooks at the grassroots so that people in all corners of the state are made aware of these successful initiatives of the state government. Referring to the Kanaklata Mahila Sabalikaran Achoni through which funds are being provided to women SHGs of the state, Sonowal said the state government does not want women SHGs to fail and for that MLAs must follow up on how the funds are being spent by the SHGs and facilitate proper utilisation of the funds so that the women can succeed economically. He also asked the MLAs to keep a tab on the ‘Ujjwala’ scheme and go to the beneficiaries frequently to enquire about their problems in using LPG and get their feedback. The budget announcement of providing 4 LED lights to 52 lakh families per year would be implemented soon and MLAs must play their part in making the scheme a success, he said. “Roads built during the previous government’s tenure used to break in six months or so and we do not want to construct such substandard roads. Construction of roads, bridges must be completed within the period from October to April and all procedures of tender, DPR must be completed within the rainy season. We must not waste a single day in construction season from October to April.” the chief minister said. PWD Minister Himanta Biswa Sarma, speaking said ten thousand kilometres of roads are being built under PMGSY in the state. He said during the previous government’s tenure it took 15 years to build 17,000 kms roads while 10,000 kms roads have been built in one year under the present government. He also informed that under the “Mahabir Lachit Chilarai Setu Nirman Achoni”, nearly 700 bridges would be built in the state with a total cost of Rs 1500 crore. Additionally, Rs 1 crore would be allotted against each of the 800 tea gardens in the state for building roads within the tea garden areas. 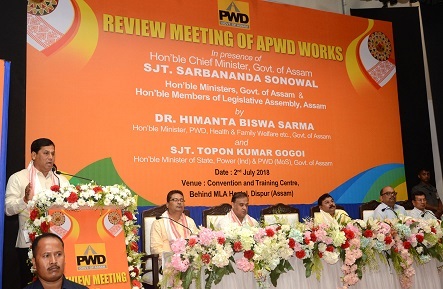 MoS for PWD Tapan Gogoi, Housefed Chairman Ranjit Kumar Dass, Additional Chief Secretary of PWD Alok Kumar, Commissioner and Secretary PWD Rajesh Kemprai along with several ministers and BJP MLAs were also present in the meeting.